The poverty threshold, poverty limit or poverty line is the minimum level of income deemed adequate in a particular country. In practice, like the definition of poverty, the official or common understanding of the poverty line is significantly higher in developed countries than in developing countries. In 2008, the World Bank came out with a figure (revised largely due to inflation) of $1.25 a day at 2005 purchasing-power parity (PPP). In October 2015, the World Bank updated the international poverty line to $1.90 a day. The new figure of $1.90 is based on ICP purchasing power parity (PPP) calculations and represents the international equivalent of what $1.90 could buy in the US in 2011. The new IPL replaces the $1.25 per day figure, which used 2005 data. Most scholars agree that it better reflects today's reality, particularly new price levels in developing countries. The common international poverty line has in the past been roughly $1 a day. At present the percentage of the global population living under extreme poverty is likely to fall below 10% according to the World Bank projections released in 2015, although this figure is claimed by scholars to be artificially low due to the effective reduction of the IPL in 2015. Charles Booth, a pioneering investigator of poverty in London at the turn of the 20th century, popularised the idea of a poverty line, a concept originally conceived by the London School Board. Booth set the line at 10 (50p) to 20 shillings (£1) per week, which he considered to be the minimum amount necessary for a family of four or five people to subsist on. Benjamin Seebohm Rowntree (1871–1954), a British sociological researcher, social reformer and industrialist, surveyed rich families in York, and drew a poverty line in terms of a minimum weekly sum of money "necessary to enable families … to secure the necessaries of a healthy life", which included fuel and light, rent, food, clothing, and household and personal items. Based on data from leading nutritionists of the period, he calculated the cheapest price for the minimum calorific intake and nutritional balance necessary, before people get ill or lose weight. He considered this amount to set his poverty line and concluded that 27.84% of the total population of York lived below this poverty line. This result corresponded with that from Charles Booth's study of poverty in London and so challenged the view, commonly held at the time, that abject poverty was a problem particular to London and was not widespread in the rest of Britain. Rowntree distinguished between primary poverty, those lacking in income and secondary poverty, those who had enough income, but spent it elsewhere (1901:295–96). The term "absolute poverty" is also sometimes used as a synonym for extreme poverty. Absolute poverty is the absence of enough resources to secure basic life necessities. According to a UN declaration that resulted from the World Summit on Social Development in Copenhagen in 1995, absolute poverty is "a condition characterised by severe deprivation of basic human needs, including food, safe drinking water, sanitation facilities, health, shelter, education, and information. It depends not only on income, but also on access to services." Food: Body mass index must be above 16. Safe drinking water: Water must not come solely from rivers and ponds, and must be available nearby (fewer than 15 minutes' walk each way). Sanitation facilities: Toilets or latrines must be accessible in or near the home. Health: Treatment must be received for serious illnesses and pregnancy. Shelter: Homes must have fewer than four people living in each room. Floors must not be made of soil, mud, or clay. Education: Everyone must attend school or otherwise learn to read. Information: Everyone must have access to newspapers, radios, televisions, computers, or telephones at home. Access to services: This item is undefined by Gordon, but normally is used to indicate the complete panoply of education, health, legal, social, and financial (credit) services. The basic needs approach is one of the major approaches to the measurement of absolute poverty in developing countries. It attempts to define the absolute minimum resources necessary for long-term physical well-being, usually in terms of consumption goods. The poverty line is then defined as the amount of income required to satisfy those needs. The 'basic needs' approach was introduced by the International Labour Organization's World Employment Conference in 1976. "Perhaps the high point of the WEP was the World Employment Conference of 1976, which proposed the satisfaction of basic human needs as the overiding objective of national and international development policy. The basic needs approach to development was endorsed by governments and workers' and employers' organizations from all over the world. It influenced the programmes and policies of major multilateral and bilateral development agencies, and was the precursor to the human development approach." A traditional list of immediate "basic needs" is food (including water), shelter, and clothing. Many modern lists emphasize the minimum level of consumption of 'basic needs' of not just food, water, and shelter, but also sanitation, education, and health care. Different agencies use different lists. In 1978, Ghai investigated the literature that criticized the basic needs approach. Critics argued that the basic needs approach lacked scientific rigour; it was consumption-oriented and antigrowth. Some considered it to be "a recipe for perpetuating economic backwardness" and for giving the impression "that poverty elimination is all too easy". Amartya Sen focused on 'capabilities' rather than consumption. In the development discourse, the basic needs model focuses on the measurement of what is believed to be an eradicable level of poverty. Relative poverty means low income relative to others in a country; for example, below 60% of the median income of people in that country. It is the "most useful measure for ascertaining poverty rates in wealthy developed nations". Relative poverty measure is used by the United Nations Development Program (UNDP), the United Nations Children's Fund (UNICEF), the Organisation for Economic Co-operation and Development (OECD) and Canadian poverty researchers. In the European Union, the "relative poverty measure is the most prominent and most–quoted of the EU social inclusion indicators." "Relative poverty reflects better the cost of social inclusion and equality of opportunity in a specific time and space." "Once economic development has progressed beyond a certain minimum level, the rub of the poverty problem – from the point of view of both the poor individual and of the societies in which they live – is not so much the effects of poverty in any absolute form but the effects of the contrast, daily perceived, between the lives of the poor and the lives of those around them. For practical purposes, the problem of poverty in the industrialized nations today is a problem of relative poverty (page 9)." However, some have argued that as relative poverty is merely a measure of inequality, using the term 'poverty' for it is misleading. For example, if everyone in a country's income doubled, it would not reduce the amount of 'relative poverty' at all. In 1776, Adam Smith argued that poverty is the inability to afford "not only the commodities which are indispensably necessary for the support of life, but whatever the custom of the country renders it indecent for creditable people, even of the lowest order, to be without." In 1958, John Kenneth Galbraith argued, "People are poverty stricken when their income, even if adequate for survival, falls markedly behind that of their community." In 1964, in a joint committee economic President's report in the United States, Republicans endorsed the concept of relative poverty: "No objective definition of poverty exists. ... The definition varies from place to place and time to time. In America as our standard of living rises, so does our idea of what is substandard." In 1965, Rose Friedman argued for the use of relative poverty claiming that the definition of poverty changes with general living standards. Those labelled as poor in 1995, would have had "a higher standard of living than many labelled not poor" in 1965. In 1979, British sociologist, Peter Townsend published his famous definition: "individuals... can be said to be in poverty when they lack the resources to obtain the types of diet, participate in the activities and have the living conditions and amenities which are customary, or are at least widely encouraged or approved, in the societies to which they belong (page 31)." Brian Nolan and Christopher T. Whelan of the Economic and Social Research Institute (ESRI) in Ireland explained that "poverty has to be seen in terms of the standard of living of the society in question." Relative poverty measures are used as official poverty rates by the European Union, UNICEF and the OEDC. The main poverty line used in the OECD and the European Union is based on "economic distance", a level of income set at 60% of the median household income. A measure of relative poverty defines "poverty" as being below some relative poverty threshold. For example, the statement that "those individuals who are employed and whose household equivalised disposable income is below 60% of national median equivalised income are poor" uses a relative measure to define poverty. The term relative poverty can also be used in a different sense to mean "moderate poverty" – for example, a standard of living or level of income that is high enough to satisfy basic needs (like water, food, clothing, housing, and basic health care), but still significantly lower than that of the majority of the population under consideration. National estimates are based on population-weighted subgroup estimates from household surveys. Definitions of the poverty line do vary considerably among nations. For example, rich nations generally employ more generous standards of poverty than poor nations. Even among rich nations, the standards differ greatly. Thus, the numbers are not comparable among countries. Even when nations do use the same method, some issues may remain. In United States, the poverty thresholds are updated every year by Census Bureau. The threshold in United States are updated and used for statistical purposes. In 2015, in the United States, the poverty threshold for a single person under 65 was an annual income of US$11,770; the threshold for a family group of four, including two children, was US$24,250. According to the U.S. Census Bureau data released on 13 September 2011, the nation's poverty rate rose to 15.1 percent in 2010. In the UK, "more than five million people – over a fifth (23 percent) of all employees – were paid less than £6.67 an hour in April 2006. This value is based on a low pay rate of 60 percent of full-time median earnings, equivalent to a little over £12,000 a year for a 35-hour working week. In April 2006, a 35-hour week would have earned someone £9,191 a year – before tax or National Insurance". India's official poverty level as of 2005[update], on the other hand, is split according to rural versus urban thresholds. For urban dwellers, the poverty line is defined as living on less than 538.60 rupees (approximately US$12) per month, whereas for rural dwellers, it is defined as living on less than 356.35 rupees per month (approximately US$7.50). Poverty is impacted through wealth inequality, while the rich are getting richer the poor are losing even more. Wealth facilitates the continuation of economic inequality, the lowest quintile of Americans only own less than 1 percent of all wealth in America while the top quintile owns 60 percent of the wealth. Wealth inequality is more extreme and a larger indicator of financial well being than income inequality, this means it impacts people in poverty even more. People in poverty do not have the access to resources that in the upper quintile do, such as stocks, investments, multiple houses, stable jobs, and better education. Stocks are a good example of this, while 94.9 of the top 1 percent own stocks only 20.8 percent of the bottom 20 percent of Americans own stock. This inequality of access allows for wealth inequality to grow and continue to impact those in poverty. Women and children find themselves impacted by poverty more often than men, most specifically when apart of single mother families. This is due to the feminization of poverty, how the poverty rate of women has increasingly exceeded that of mens. While the overall poverty rate is 12.3%, women are 13.8% likely to fall into poverty and men are below the overall rate at 11.1%. Most women if they fall into poverty because of the expectation that they will be taking care of children while trying to maintain their jobs, because of the expectation that women will be with kids they are segregated into lower paying jobs than male counterparts. Along with being put into lower paying jobs women do more unpaid work for their children than men do. This is how the percent of single mothers has risen to 34%, much above the national rate. Women and children (as single mother families) find themselves as apart of low class communities because they are 21.6% more likely to fall into poverty. Racial minorities have been a large part of American history. 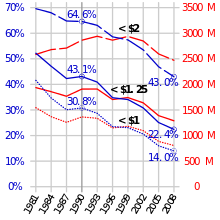 A minority group is defined as “a category of people who experience relative disadvantage as compared to members of a dominant social group.” Minorities are traditionally separated into the following groups: African Americans, American Indians, Alaska Natives, Asians, Pacific Islanders, and Hispanics. They must be accounted for when discussing the poverty line in the U.S. in 2018 because the majority of America's population consists of immigrants. According to the current U.S. Poverty statistics, Black Americans - 21%, Foreign born non-citizens - 19%, Hispanic Americans - 18%, and Adults with a disability - 25%. This does not include all minority groups, but these groups alone account for 85% of people under the poverty line in the United States. Whites have a poverty rate of 8.7%; the poverty rate is more than double for Black and Hispanic Americans. Living below the poverty threshold can have a major impact on a child’s education. The psychological stresses induced by poverty may affect a student’s ability to perform well academically. In addition, the risk of poor health is more prevalent for those living in poverty. Health issues commonly affect the extent to which one can continue and fully take advantage of his or her education. Poor students in the United States are more likely to dropout of school at some point in their education. Research has also found that children living in poverty perform poorly academically and have lower cognitive abilities. Impoverished children also display more behavioral issues than others. Schools in impoverished communities usually do not receive much funding, which can also set their students apart from those living in more affluent neighborhoods. Even upward mobility that brings a child out of poverty may not have a significant positive impact on his or her education; inadequate academic habits that form as early as preschool typically do not improve despite changes in socioeconomic status. The nation’s poverty threshold is issued by the Census Bureau. According to the Office of Assistant Secretary for Planning and Evaluation the threshold is statistically relevant and can be a solid predictor of people in poverty. The reasoning for using Federal Poverty Level, FPL, is due to its action for distributive purposes under the direction of Health and Human Services. So FPL is a tool derived from the threshold but can be used to show eligibility for certain federal programs. Federal poverty levels have direct effects on individual’s healthcare. In the past years and into the present government, the use of the poverty threshold has consequences for such programs like Medicaid and the Children’s Health Insurance Program. The benefits which different families are eligible for are contingent on FPL. The FPL, in turn is calculated based on federal numbers from the previous year. The benefits and qualifications for federal programs are dependent on number of people on a plan and the income of the total group. For 2019, the U.S Department of health & Human Services enumerate what the line is for different families. For a single person, the line is $12,490 and up to $43,430 for a family of 8, in the lower 48 states. Another issue is reduced-cost coverage. These reductions are based on income relative to FPL, and work in connection with public health services such as Medicaid. The divisions of FPL percentages are nominally, above 400%, below 138% and below 100% of the FPL. After the advent of the American Care Act, Medicaid was expanded on states bases. For example, enrolling in the ACA kept the benefits of Medicaid when the income was up to 138% of the FPL. Health Affairs along with analysis by Georgetown found that public assistance does counteract poverty threats between 2010 and 2015. In regards to Medicaid, child poverty is decreased by 5.3%, and Hispanic and Black poverty by 6.1% and 4.9% respectively. The reduction of family poverty also has the highest decrease with Medicaid over other public assistance programs. Expanding state Medicaid decreased the amount individuals paid by an average of $42, while it increased the costs to $326 for people not in expanded states. The same study analyzed showed 2.6 million people were kept out of poverty by the effects of Medicaid. From a 2013-2015 study, expansion states showed a smaller gap in health insurance between households making below $25,000 and above $75,000. Expansion also significantly reduced the gap of having a primary care physician between impoverished and higher income individuals. In terms of education level and employment, health insurance differences were also reduced. Non-expansion also showed poor residents went from a 22% chance of being uninsured to 66% from 2013 to 2015. Living above or below the poverty threshold is not necessarily a position in which an individual remains static. As many as one in three impoverished people were not poor at birth; rather, they descended into poverty over the course of their life. Additionally, a study which analyzed data from the Panel Study of Income Dynamics (PSID) found that nearly 40% of 20-year-olds received food stamps at some point before they turned 65. This indicates that many Americans will dip below the poverty line sometime during adulthood, but will not necessarily remain there for the rest of their life. Furthermore, 44% of individuals who are given transfer benefits (other than Social Security) in one year do not receive them the next. Over 90% of Americans who receive transfers from the government stop receiving them within 10 years, indicating that the population living below the poverty threshold is in flux and does not remain constant. Using a poverty threshold is problematic because having an income slightly above or below is not substantially different; the negative effects of poverty tend to be continuous rather than discrete, and the same low income affects different people in different ways. To overcome this problem, a poverty index or indices can be used instead; see income inequality metrics. A poverty threshold relies on a quantitative, or purely numbers-based, measure of income. If other human development-indicators like health and education are used, they must be quantified, which is not a simple (if even achievable) task. Using a single monetary poverty threshold is problematic when applied worldwide, due to the difficulty of comparing prices between countries. Prices of the same goods vary dramatically from country to country; while this is typically corrected for by using purchasing power parity (PPP) exchange rates, the basket of goods used to determine such rates is usually unrepresentative of the poor, most of whose expenditure is on basic foodstuffs rather than the relatively luxurious items (washing machines, air travel, healthcare) often included in PPP baskets. The economist Robert C. Allen has attempted to solve this by using standardized baskets of goods typical of those bought by the poor across countries and historical time, for example including a fixed calorific quantity of the cheapest local grain (such as corn, rice, or oats). In addition to wage and salary income, investment income and government transfers such as SNAP (Supplemental Nutrition Assistance Program, also known as food stamps) and housing subsidies are included in a household's income. Studies measuring the differences between income before and after taxes and government transfers, have found that without social support programs, poverty would be roughly 30% to 40% higher than the official poverty line indicates. Further, the U.S. Census Bureau calculates the poverty line the same throughout the U.S. regardless of the cost-of-living in a state or urban area. For instance, the cost-of-living in California, the most populous state, was 42% greater than the U.S. average in 2010, while the cost-of-living in Texas, the second-most populous state, was 10% less than the U.S. average. In 2017, California had the highest poverty rate in the country when housing costs are factored in, a measure calculated by the Census Bureau known as "the supplemental poverty measure". ^ "World Bank Forecasts Global Poverty to Fall Below 10% for First Time; Major Hurdles Remain in Goal to End Poverty by 2030". www.worldbank.org. Retrieved 6 October 2015. ^ Hildegard Lingnau (19 February 2016). "Major breakthrough". D+C, development&cooperation. Retrieved 27 April 2016. ^ Hickel, Jason (1 November 2015). "Could you live on $1.90 a day? That's the international poverty line". The Guardian. ISSN 0261-3077. Retrieved 10 January 2017. ^ a b "Indicators of Poverty and Hunger" (PDF). Retrieved 14 February 2008. ^ a b "The World Employment Programme at ILO" (PDF). Archived from the original (PDF) on 19 March 2014. ^ a b Richard Jolly (October 1976). "The World Employment Conference: The Enthronement of Basic Needs". Development Policy Review. A9 (2): 31–44. doi:10.1111/j.1467-7679.1976.tb00338.x. ^ Denton, John A. (1990). Society and the official world: a reintroduction to sociology. Dix Hills, N.Y: General Hall. p. 17. ISBN 978-0-930390-94-5. ^ Dharam Ghai (June 1978). "Basic Needs and its Critics". Institute of Development Studies. 9 (4): 16–18. doi:10.1111/j.1759-5436.1978.mp9004004.x. ^ a b Raphael, Dennis (June 2009). "Poverty, Human Development, and Health in Canada: Research, Practice, and Advocacy Dilemmas". Canadian Journal of Nursing Research. 41 (2): 7–18. ^ a b Child poverty in rich nations: Report card no. 6 (Report). Innocenti Research Centre. 2005. ^ a b "Growing unequal? Income distribution and poverty in OECD countries". Paris, France: Organisation for Economic Co-operation and Development (OECD). 2008. ^ a b Human development report: Capacity development: Empowering people and institutions (Report). Geneva: United Nations Development Program. 2008. ^ a b "Child Poverty". Ottawa, ON: Conference Board of Canada. 2013. ^ a b Jonathan Bradshaw; Yekaterina Chzhen; Gill Main; Bruno Martorano; Leonardo Menchini; Chris de Neubourg (January 2012). Relative Income Poverty among Children in Rich Countries (PDF) (Report). Innocenti Working Paper. Florence, Italy: UNICEF Innocenti Research Centre. ISSN 1014-7837. ^ A League Table of Child Poverty in Rich Nations (Report). Innocenti Report Card No.1. Florence, Italy: UNICEF Innocenti Research Centre. ^ Adam Smith (1776). An Inquiry Into the Nature and Causes of the Wealth of Nations. 5. ^ a b c d Peter Adamson; UNICEF Innocenti Research Centre (2012). Measuring child poverty: New league tables of child poverty in the world's rich countries (PDF) (Report). UNICEF Innocenti Research Centre Report Card. Florence, Italy. ^ Galbraith, J. K. (1958). The Affluent Society. Boston: Houghton Mifflin. ^ Minority [Republican] views, p. 46 in U.S. Congress, Report of the Joint Economic Committee on the January 1964 Economic Report of the President with Minority and Additional Views (Report). Washington, D.C.: US Government Printing Office. January 1964. ^ Friedman, Rose. D. (1965). Poverty: Definition and Perspective. American Enterprise Institute for Public Policy Research (Report). Washington, D.C.
^ Townsend, P. (1979). Poverty in the United Kingdom. London: Penguin. ^ Callan, T.; Nolan, Brian; Whelan, Christopher T. (1993). "Resources, Deprivation and the Measurement of Poverty". Journal of Social Policy. 22 (2): 141–72. doi:10.1017/s0047279400019280. hdl:10197/1061. ^ Michael Blastland (31 July 2009). "Just what is poor?". BBC NEWS. Retrieved 25 September 2008. ^ Bardone, Laura; Guio, Anne-Catherine (2005). "In-Work Poverty: New commonly agreed indicators at the EU level" (PDF). Statistics in Focus: Population and Social Conditions. ISSN 1024-4352. Retrieved 18 February 2015. ^ "Inequality in Focus, October 2013: Analyzing the World Bank's Goal of Achieving "Shared Prosperity"". World Bank. Retrieved 16 April 2015. ^ "Annual Update of the HHS Poverty Guidelines". 22 January 2015. Retrieved 15 April 2015. ^ US Census Bureau. "How the Census Bureau Measures Poverty". Archived from the original on 20 September 2010. Retrieved 22 December 2010. ^ "Poverty Estimates for 2004-05" (PDF). Retrieved 19 November 2009. ^ Keister, Lisa A.; Moller, Stephanie (2000). "Wealth Inequality in the United States". Annual Review of Sociology. 26 (1): 63–81. doi:10.1146/annurev.soc.26.1.63. ^ "Basic Statistics". Talk Poverty. Retrieved 1 April 2019. ^ Winchester, Hilary P. M. (1990). "Women and Children Last: The Poverty and Marginalization of One-Parent Families". Transactions of the Institute of British Geographers. 15 (1): 70–86. doi:10.2307/623094. ISSN 0020-2754. ^ a b "Single Mother Statistics". Single Mother Guide. 23 March 2012. Retrieved 1 April 2019. ^ "U.S. Poverty Statistics". federalsafteynet.com. Retrieved 23 March 2019. ^ "The Faces of Poverty". USA Today. Retrieved 20 March 2019. ^ "U.S Poverty Stats". Retrieved 23 March 2019. ^ "U.S. Poverty Staistics". federalfasteynet.com. Retrieved 23 March 2019. ^ "United States Population". worldpopulationreveiw.com. Retrieved 1 March 2019. ^ a b c d e f g h i j Engle, Patrice L.; Black, Maureen M. (2008). "The Effect of Poverty on Child Development and Educational Outcomes". Annals of the New York Academy of Sciences. 1136 (1): 243–256. doi:10.1196/annals.1425.023. ISSN 1749-6632. ^ a b c d "Poverty Guidelines". ASPE. 23 November 2015. Retrieved 1 April 2019. ^ a b c "Federal Poverty Level (FPL) - HealthCare.gov Glossary". HealthCare.gov. Retrieved 1 April 2019. ^ a b c d "Will you receive an Obamacare premium subsidy?". healthinsurance.org. 27 December 2018. Retrieved 1 April 2019. ^ a b c d "Research Update: Medicaid Pulls Americans Out Of Poverty, Updated Edition". Center For Children and Families. 8 March 2018. Retrieved 1 April 2019. ^ a b c d Griffith, Kevin; Evans, Leigh; Bor, Jacob (1 August 2017). "The Affordable Care Act Reduced Socioeconomic Disparities In Health Care Access". Health Affairs. 36 (8): 1503–1510. doi:10.1377/hlthaff.2017.0083. ISSN 0278-2715. ^ a b c Fullerton, Don; Rao, Nirupama S (August 2016). "The Lifecycle of the 47%". ^ a b Grieger, Lloyd D.; Danziger, Sheldon H. (1 November 2011). "Who Receives Food Stamps During Adulthood? Analyzing Repeatable Events With Incomplete Event Histories". Demography. 48 (4): 1601–1614. doi:10.1007/s13524-011-0056-x. ISSN 1533-7790. ^ Kenworthy, L (1999). "Do social-welfare policies reduce poverty? A cross-national assessment". Social Forces. 77 (3): 1119–39. doi:10.1093/sf/77.3.1119. hdl:10419/160860. ^ Matt Levin (2 October 2017). "Expensive homes make California poorest state". San Francisco Chronicle. p. C1. Shweparde, Jon; Robert W. Greene (2003). Sociology and You. Ohio: Glencoe McGraw-Hill. p. A-22. ISBN 978-0-07-828576-9. Archived from the original on 8 March 2010. Villemez, Wayne J. (2001). "Poverty". Encyclopedia of Sociology (PDF). New York: Gale Virtual Reference Library. History of the U.S. Poverty Line by Tom Gentle, Oregon State University. The "elimination" of poverty, Takis Fotopoulos, The International Journal of Inclusive Democracy, vol.4, no.1 (January 2008). Fisher, Gordon (16 December 2005). "Relative or Absolute – New Light on the Behavior of Poverty Lines Over Time". Department of Health and Human Services. Retrieved 16 January 2008. This page was last edited on 4 April 2019, at 15:37 (UTC).